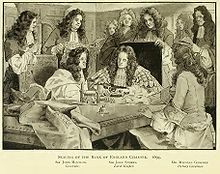 The Bank of England Act 1946 c 27 is an Act of Parliament of the United Kingdom which came into force on 14 February 1946. The Act brought all of the stock of the Bank of England into public ownership on the “appointed date” 1 March 1946. This was one of a series of nationalisations by the post-war Labour government led by Clement Attlee. During the governorship of Montagu Norman, from 1920 to 1944, the Bank made deliberate efforts to move away from commercial banking and become a central bank. In 1946, shortly after the end of Norman’s tenure, the bank was nationalised by the Labour government. This entry was posted in Uncategorized and tagged 14 February, 1946 by Admin2. Bookmark the permalink.